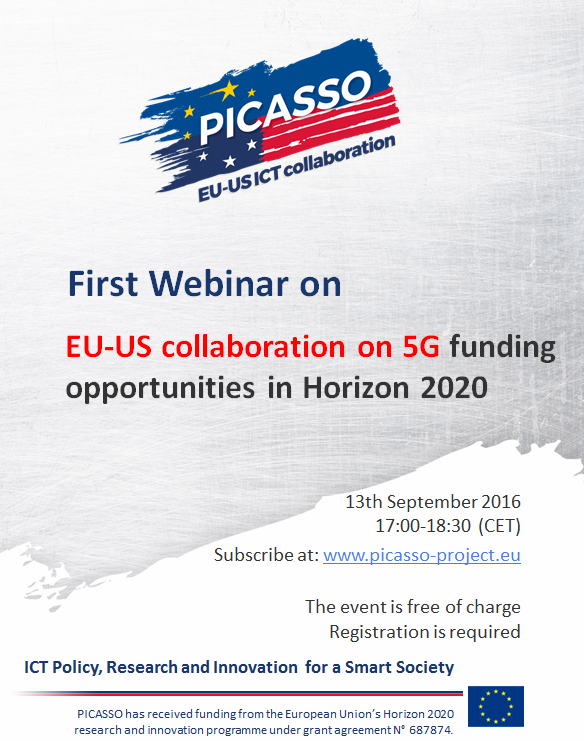 The European PICASSO project is organizing a first webinar on "EU-US collaboration on 5G funding opportunities in Horizon 2020”. With this webinar, PICASSO will explore how EU-US collaboration in 5G can be served best in the next Horizon 2020 Call for Proposals, taking into account the EU-US innovation ecosystems, the established collaboration between 5G PPP and 5G Americas as well as the target technical objectives defined by the 5G PPP Strategic Research Agenda in order to enhance collaboration with US researchers and innovators. ► Further details on the technicalities of the webinar will be sent to the registered participants in due time.